#leadershiptruth - Grief isn't a straight line. 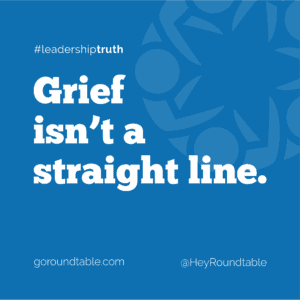 #leadershiptruth – Grief isn’t a straight line. When my Dad died in 2011 I didn‘t take a two-week ‘bereavement leave’ (the standard for most companies). Being self-employed, it’s not something I felt I could do. What I do know is that 2 weeks off the job wouldn’t have made a difference anyway. It took over a year for me to be able to think about my Dad without getting emotional. It affected my focus, my patience, my motivation. If you are going through loss, give yourself the permission to grieve and know that you’re not going to be 100% despite your best efforts. If you’re managing someone who is going through loss, know that they are not o.k. even if they tell you that they are. People show up to work two weeks following a bereavement leave (if they even took that much time) and we, as the organization, expect them to somehow be ‘fine’. They may actually present as being ‘fine’ but in my experience, this ‘normal’ demeanour is simply a thin veneer that’s protecting a raw human being who’s trying to hold it all together. Grief requires understanding, patience, empathy and a willingness to adjust expectations while the individual finds their way back to life after a death. You can’t rush a healing heart, no matter what your work deliverables may be. Be kind to yourself and give yourself time.